Exhibit, Lecture and Gilding Workshop at The Muscarelle Museum of Art | Gold Leaf Studios - Welcome to our blog! Gold Leaf Studios – Welcome to our blog! 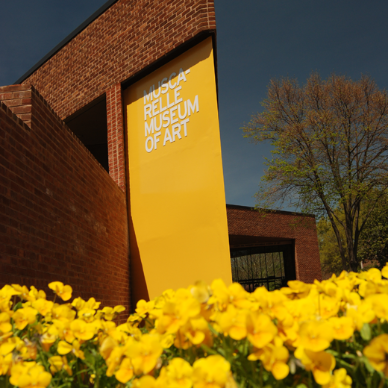 The Muscarelle Museum of Art at the College or William and Mary is host to Bill's latest frame show, "Frames: The Forgotten Art"
Bill has culled a selection of frames from his private collection to present at the Muscarelle Museum of Art at the College of William & Mary. The exhibit, “Frames: The Forgotten Art,” (on view through March 25, 2012) presents a selection of American and European frames spanning more than five centuries, from the ancient Byzantine to the contemporary. Bill will accompany the exhibit with a lecture on Friday, March 16 at 5pm, followed by a gilding workshop at 9pm. “Frames: The Forgotten Art” follows a similar path to many of Bill’s previous frame exhibits, which have aimed to introduce audiences to the importance and independent beauty of frames, as well as their integral relationship to the pictures they contain. Bill was the first historian to put together a show of American frames, titled “Frames in America, through the Institute of Architecture in 1981, and his work since then has reflected similar historical agendas. One of the masterpieces in the exhibition, if you ask Bill, is a towering baroque mirror frame with sculpted figures of gamboling putti on all four sides. This work, which once adorned the entrance hall of an Italian palazzo, was lent by the author and Virginia resident Mark Helprin. Space is very limited for the gilding workshop, so sign up quick! To sign up or get lecture details contact Amy Gorman, Curator of Education & New Media at the Muscarelle, at Museum@wm.edu, or 757 221 2703. Or visit the Muscarelle Museum of Art online.